Semi-Flex Foam, Water-Activated chemical injection grout. Our most versatile product. Water activated hydrophobic polyurethane foam, expands up to 30-40 times. Used to stop gushing water, to fill voids, hairline cracks and for soil stabilization. Our polyurea is a self leveling, 100% solids, two component, 1:1 ratio, very flexible elastomer. It is an excellent joint and crack filler for concrete in applications that are time critical. It works well in adverse temperature conditions as the material cures rapidly in ambient temperatures from -20F to 130F. The tack free time is 5 to 15 minutes. This permits to reopen the jobsite to vehicle and foot traffic just one hour after the application. Call (479) 751-0556 or click here now to schedule a FREE Foundation Inspection! When most people notice foundation cracks in their home, they many times find themselves asking the question "what can I do to fix the problem?". 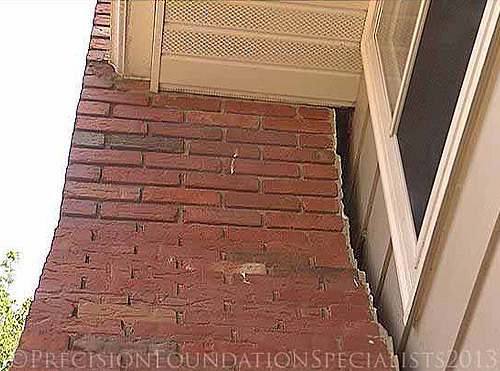 If you have noticed foundation cracks or similar symptoms of a foundation settlement such as drywall cracks, doors and windows that will not open and close properly, sloping floors or exterior brick cracks. All of these issues let you know that you are dealing with a foundation issue that is caused by ever-changing soil conditions around and under your home. If you have noticed cracks in the foundation of your home or building, we are here to help you fast! Foundation problems are many times caused by changes in the moisture content of the soils around your home. During extended periods of dry weather (drought), the soils around and under your home can shrink, causing your home to settle. This is called “linear shrinkage” and can only be measured by performing a plasticity indices "PI" (Atterberg Limit). When this occurs, you may begin to notice foundation cracks throughout your home that indicate soil differential settlement! During extremely wet periods, the soils under your home can do one of two things. Swell or more often, the soils will soften and even collapse which can also cause your home to sink or settle. Another foundation problem caused by wet soil conditions is deflection of walls. If your home has a basement or crawlspace, you may notice foundation cracks in the walls, which can be caused when hydrostatic pressure is built behind the wall after a moderate or heavy rain. When hydrostatic pressure builds on your foundation walls, it will result in the wall moving inward. If your basement walls begin to fail, you will notice foundation cracks as the wall will start to bow, buckle, tip, or slide inward. 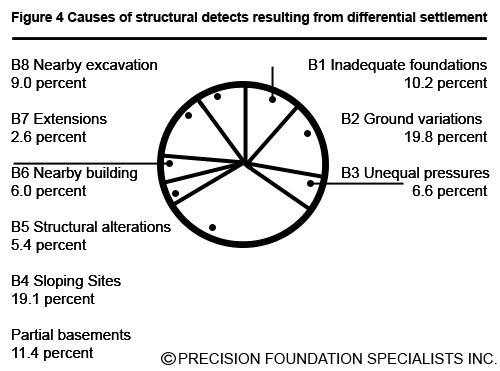 There are many reasons that foundation problems exist and Precision Foundation Specialists Inc. will help you understand what caused the problems and your options for fixing them. Our Certified Special Inspectors would be happy to contact you to set up your appointment for a free inspection. They will even discuss everything with you over the telephone just to ease your mind. Foundation cracks are an unsettling problem that leave you concerned about the condition of your home. Because foundation problems must be disclosed when selling a home, many homeowners need to find a solution to their foundation problem so that the price of their home is not decimated. Since foundation problems can reduce the value of a home by 12 - 22%. Fixing foundation problems is usually the most logical option for homeowners. Fixing foundation problems is what we specialize in so if you have foundation cracks or other symptoms of a foundation failure, we are here for you. Let our qualified staff come up with an proven solution just for you. Each foundation problem has its one unique solution. No two problems are the same. With the cheap construction methods used by homebuilders, the pressures of the earth, settling and heaving soils, and just your home’s weight bearing down, your foundation takes it from all sides. When your foundation "gives up" and fails, the problems that appear can range from cosmetic to devastating. Once a problem occurs, it will only continue to worsen as the home gets older and the problem that caused the foundation failure continues. PFS Inc. is dedicated to recognizing these issues and addressing them with a permanent solution. Many homeowners assume that if a house is new then the foundation must be strong. Surely the builder would have built it as if he owned it, right?WRONG! Unfortunately, this is a very common misconception. 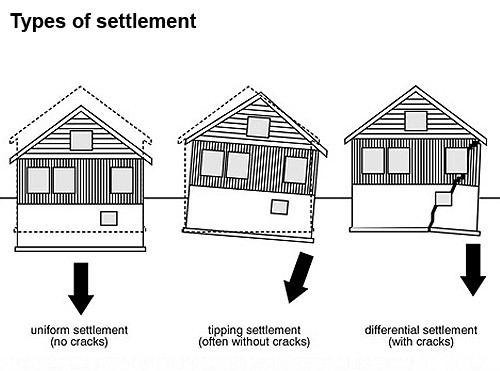 No matter how old or new a home is; cracks, foundation settlement and other foundation problems are still possible. Every crack and sag in a home is a separate problem that will worsen and compromise the structural integrity of your home. If the pressures that created these cracks is not addressed, then the stress/strain will continue. 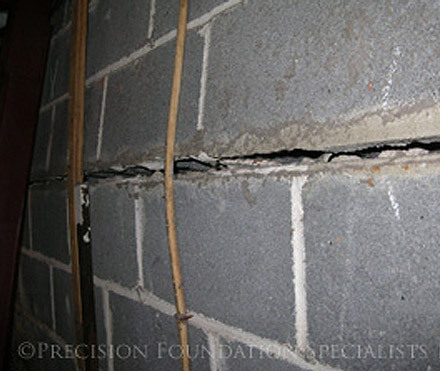 Very often, foundation wall cracks are not detected until long after they have formed. However, these cracks are often still very distressing; causing homeowners to believe that this crack appeared suddenly. While this is usually not the case, it's certainly important to treat all foundation wall fractures as a potentially serious problem that should be assessed by a professional foundation engineer or specialist. After a proper assessment by a professional we can plot the proper course of action to repair your foundation and maintain your investment as every case is completely unique. No matter how large or small, all wall cracks and fractures should always be addressed to prevent serious upcoming issues with your foundation and the integrity of your entire home. Rest assured that our specialist can handle it! Cracks in the foundation walls will most often appear at the weakest points, including corners, edges of basement window frames, holes for service, concrete cold joints, long spans of wall, pipe penetrations, and along the tie rods in the foundation. Any cracks detected should be checked regularly – if you suspect that the crack has moved, spread, or widened, then your basement walls may be experiencing increased fatigue which will increase the damage and deepen the problem. Keep an eye on the crack by monitoring its length. Mark the ends of the crack with a pencil, and draw several "alignment" marks along the crack to check that the edges of the crack are not shifting unevenly. Date all marks to help record the rate of deterioration. 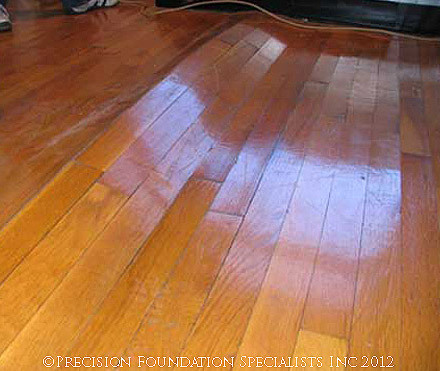 Since Precision Foundation Specialists Inc. offers all written estimates and consultations at no cost or obligation to you, do not hesitate to contact us for a FREE estimate today! 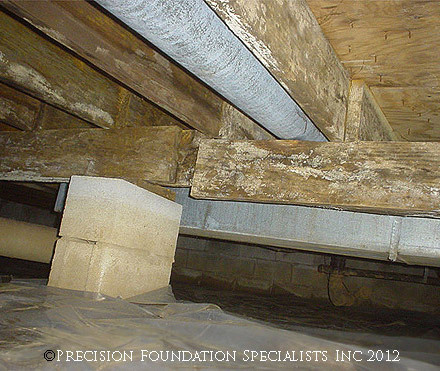 Settled columns, sagging beams, and wavy floor joists within a crawlspace lead to extensive cosmetic and structural damage in a home if left uncorrected. Symptoms such as sloping floors and cracks in drywall are common visual signs of repair being needed. 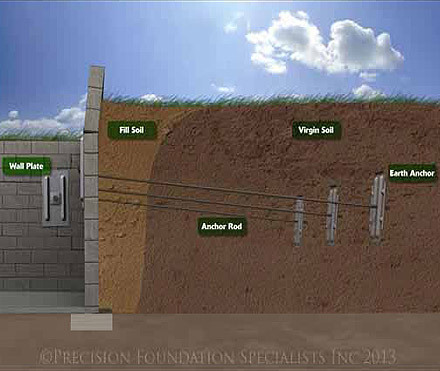 Settling of the columns in the crawlspace area is most often associated by weak foundation soils. Over the time, the soils shift and settle with changes in moisture content and density; causing movement in the columns and the beams located above these columns. Sagging floor joists & beams are often the visual result of excessive spacing of the existing pier columns causing an overloading of the beams and causing them to bend and sag. Excessive moisture and rotten wood can also cause beams and joists to weaken over time as well as termite damage. The Precision Foundation Specialists Smart Support System is the answer. The Smart Support is an additional support system that helps correct issues caused by inadequate structural design, weak foundation soils supporting columns or weakening & rotten wood in the floor system due to high humidity and moisture levels within a crawlspace. The Support System levels and stabilizes the beams and floor joists. A solid base of engineered select fill addresses problems with weak foundation soils by effectively transferring the load to a competent soil bearing of 2,000 pounds per square foot (psf). Then, treated custom cut timber is placed under the existing floor joists. The system is anchored by using high strength concrete. The system is designed for each client based upon construction practices accepted by the latest revision of the 2012 International Residential Code as well as Engineers recommendations. The system is manufactured only by PFS Inc. and provides the best opportunity to lift your floors and walls back to their original, level position. We can not guarantee that drywall cracks will close; however, we are successful 90% of the time. 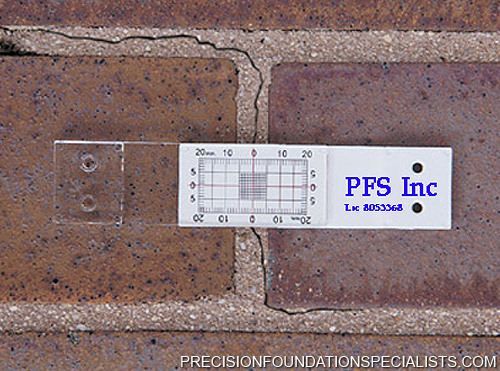 PFS Inc. sets the standard in home and floor leveling. Drying a wet or damp basement is not a do it yourself job. Thankfully we have dried hundreds of damp wet basements and have the skill and experience to make your basement a drier, cleaner, healthier place. 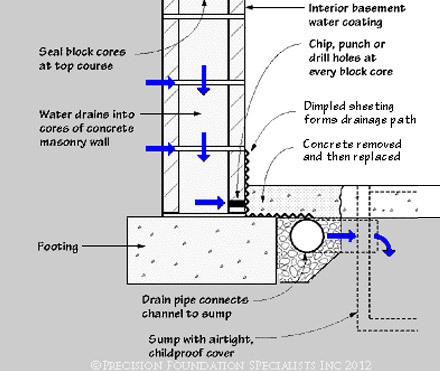 Waterproofing your damp, wet basement will expand the potential livable and usable space in your home. You will no longer avoid the basement; instead, you will be able to utilize this revitalized area to increase living space or for use as dry storage. The increase in space means often increases the value of your home. Waterproofing a wet basement will allow you to use or even finish the basement without the potential of ruining drywall, paneling, boxes or furniture. Waterproofing will create a healthier environment in your home by eliminating dampness. Mold THRIVES in damp environments! PFS Inc. offers the problem solving, H2O Guard System which has a special design that separates it from the soil under your floor, sitting it on the foundation's footing so it will never clog. Other waterproofing systems sit in the soils and mud (aka The Mud Zone). The state-of-the-art system performs much better than the old fashioned corrugated black hose and ceramic drain tile systems offered by other contactors. This economical and effective waterproofing system from PFS Inc. intercepts water at the perimeter of your basement and drains it safely away unseen - guaranteed! Our unique design creates a clean edge and keep debris out of the system. The H2OGuard drainage system will keep your basement clean and dry so you can use the space for dry storage, recreational purposes, or to finish for additional living space. We can install or fix your basement waterproofing now and prevent a flooding disaster that could ruin your cherished personal belongings and cause expensive basement flooding & repair! 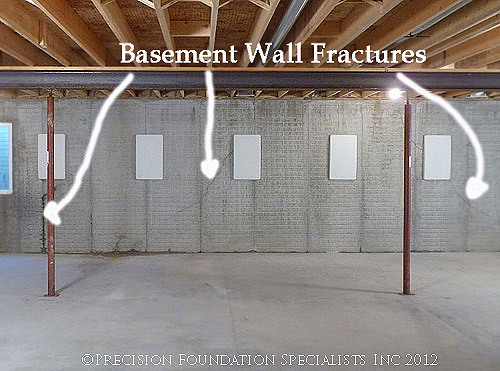 Using our Foundation Armor product, we can waterproof most basements from the inside with one (1) application. It will withstand 100 psi of pressure within six (6) hours of application. H2OGuard, exclusively from Precision Foundation Specialist, is light years ahead of the antiquated drain tile used by other waterproofing companies. 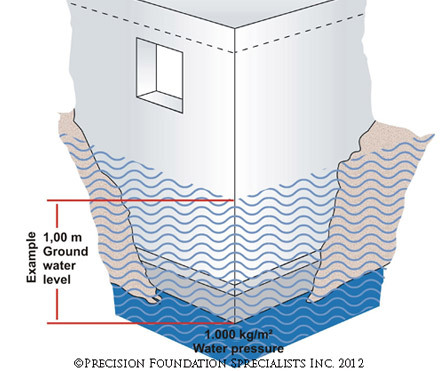 Benefits of choosing Precision Foundation Specialists Inc.
PFS Inc. provides the most meticulously researched, highest quality sump pump systems in the industry. Every sump pump system is individually designed with an air-tight sump pump crock lid, floor drain, anti back flow check valve, & a patented Pump Clean Stand! PFS Inc. offers multiple outstanding sump pump solutions for home owners who want to dry their wet basement and change it into usable space. 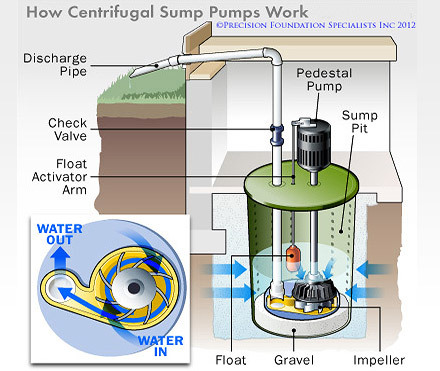 Each system has a sump pump water zone, a good long lasting pump liner, plus a reliable sump pump. Our experienced installation crews pride themselves in completing outstanding basement waterproofing jobs, often in a single day. We are eager to assist in drying your damp or wet basement! For a free, no obligation sump pump or complete waterproofing proposal, call or contact us by clicking here now!